Last weekend for Mother’s Day, Little Jenny and I went cherry picking and we came home with 6lbs of yummy, juicy, cherries. 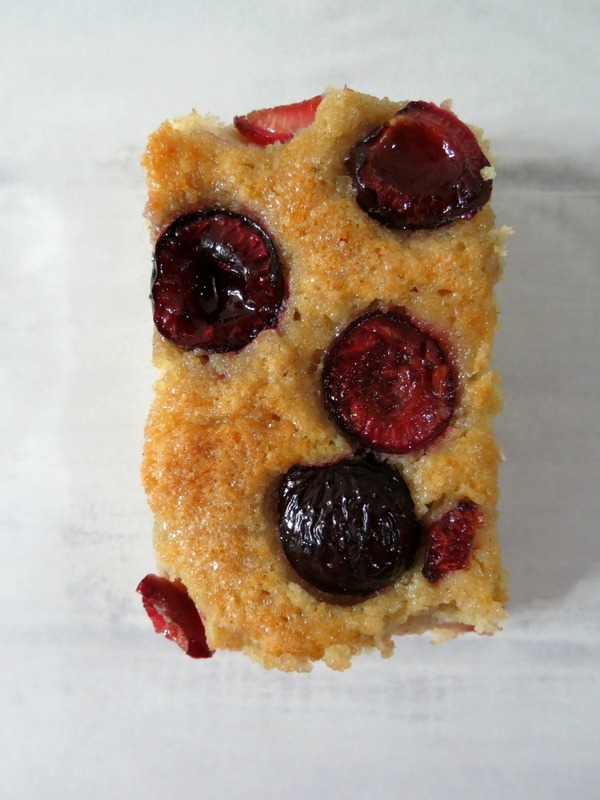 I love cherries, but I had no idea what to make with them. 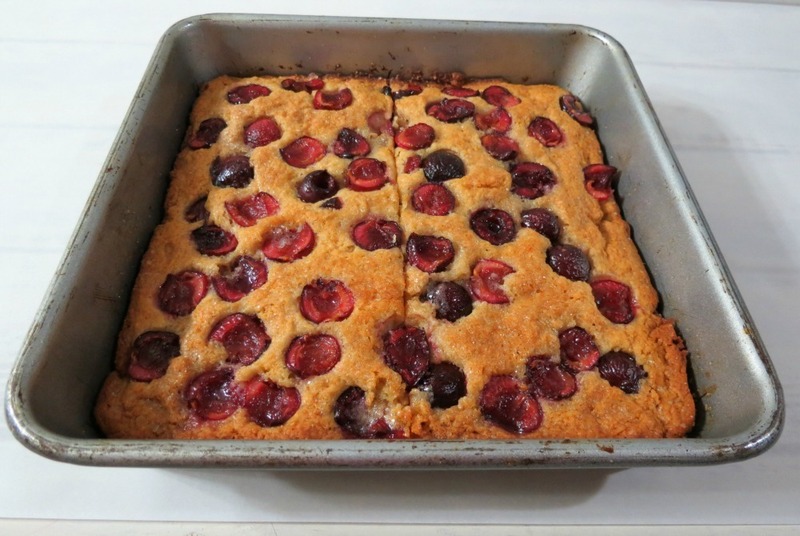 On Mother’s Day my Husband asked if I could make the Blueberry Coffee Cake but with Cherries instead. I thought, sure why not. It was a great idea, I must admit. The cake turned out amazingly! It’s fluffy, light and almost tastes like cherry pie. I’m all for that!! I have to admit sometimes my Husband gets great ideas and making this cake with cherries was a wonderful idea! The cake is perfect for breakfast or a nice light snack. I love that you get 12 nice size slices for only 123 calories. Yah! The only substitutions I made was on the flour. I used white whole wheat flour and all purpose flour. I have to admit using all purpose flour really made the cake rise a tad bit more than with whole wheat pastry flour. I also used almond extract instead of vanilla. I think almonds and cherries go so nicely together. Here is the cake before it went into the oven. When I started to cut the cake, I realized I didn’t get a picture of it, fresh out of the oven. Here it is with a cut down the middle. 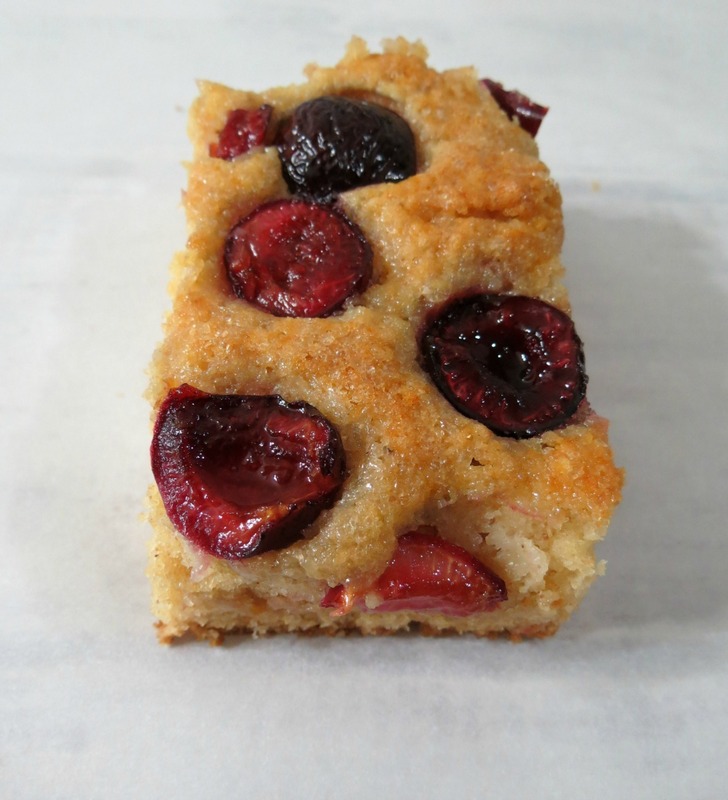 Speaking of cutting, the cherries do stick a bit, so the slices are not as perfect as the blueberry coffee cake. I can’t believe how much time I have spent in the past couple of days pitting cherries. Thank goodness for a cherry pitter. I couldn’t even imagine doing this without one. I did end up with stained hands too, but that’s ok, it was well worth it. 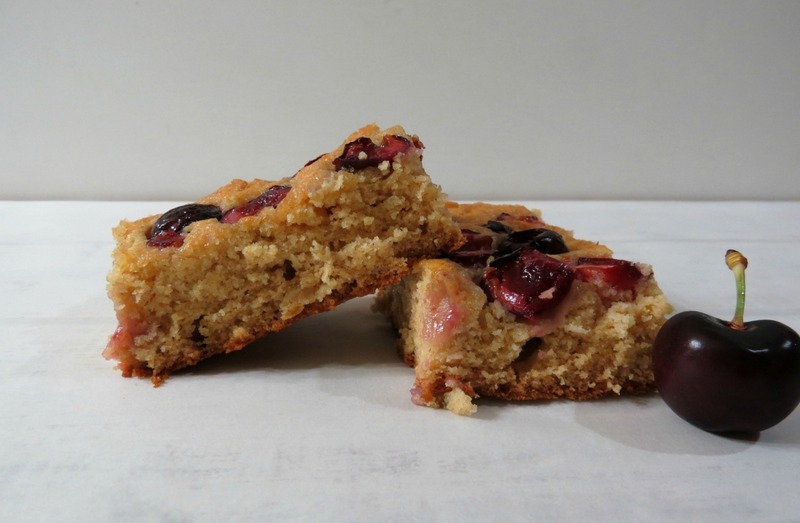 A light, fluffy cake full of fresh cherries and sprinkled with sugar. Preheat the oven to 375°F. Spray a 9-inch square baking dish with cooking spray. In a medium bowl, whisk together the flours, baking powder, and salt; set a side. Using an electric mixer, beat the coconut oil, butter and sugar. Beat in the almond extract and egg until blended. Spread the batter in the bottom of the baking dish. I used my fingers to spread it out. 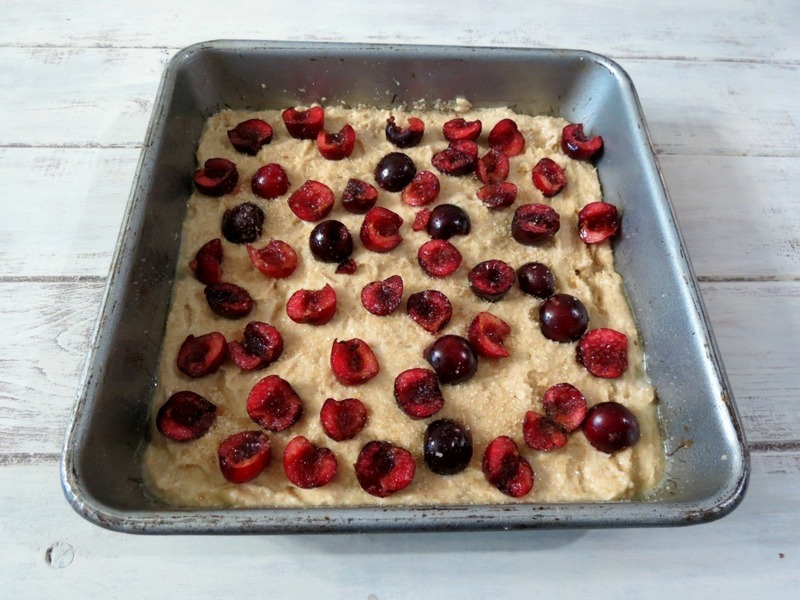 Lay 1 cup cherries on the batter and sprinkle with turbinado sugar. 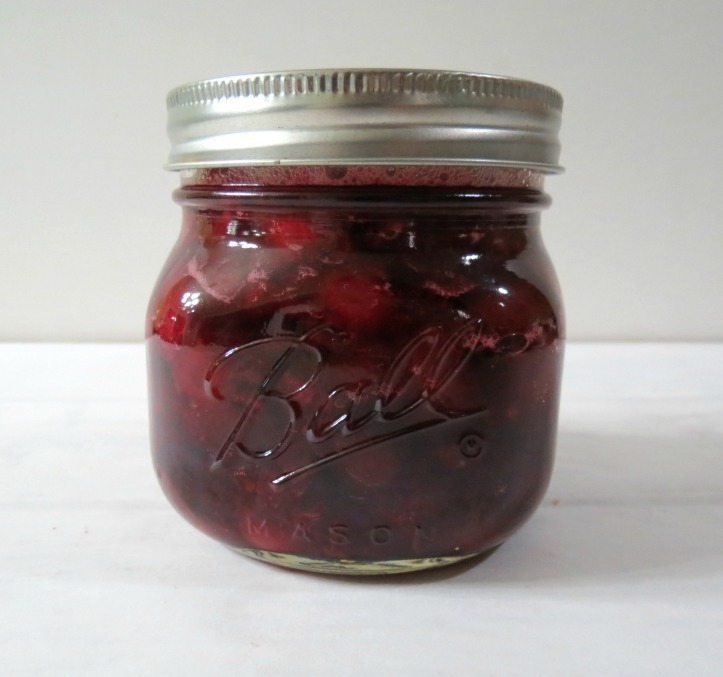 I figured since I was pitting cherries, I might as well make some cherry quick jam. I love the jam! I use it in my yogurt and ice cream. It’s so good!! I love that you don’t need to can it either and it will last a couple of weeks in the refrigerator. Well I’m off to do some kitchen cleaning, not fun, but it must be done! 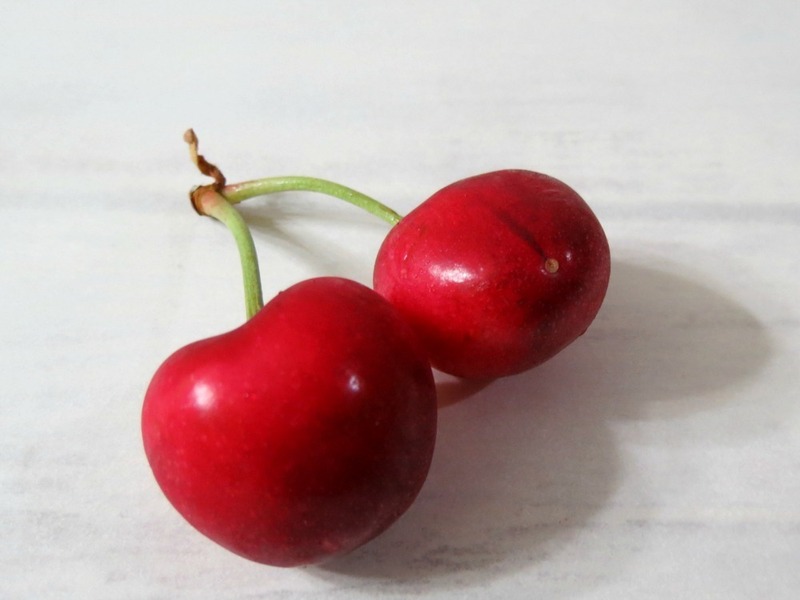 I hope you got your cherries, whether you bake with them or just eat them the way they are! They are an amazing fruit and taste best this time of year! I know I love cherries! I have been baking and eating it like crazy! I think I ate almost 6lbs in a week! Crazy!! Yummmmmmm! Fresh cherries are soooooo good! I know they are! I have eaten so many cherries this past week, it’s crazy!! I would love cake with cherries so much! Oh my, look at that!!! I would just love a piece please! !